The Thurlby Thander Instruments model PSA2701T. Photo courtesy TTi. One specialty I offer my clients is troubleshooting and determining potential fixes for their products in order to get them to comply with worldwide EMC standards. Ideally, we want to do this prior to going out for compliance verification testing. As I travel a lot in my job, I like to take the minimum amount of test equipment possible. One of the fundamental pieces of gear is the spectrum analyzer, but they usually weigh a ton and are usually quite expensive. About three years ago, I ran into quite a deal on a handheld spectrum analyzer that truly fit into my hand – unlike so-called “handhelds” that require both hands! Manufactured by Thurlby Thander Instruments, and virtually unknown here in the States, it’s distributed by well-known Newark Electronics, under the AIM-TTI brand (although, the actual unit is still branded TTi). There are two models offered and I’ve had a chance to try both. The PSA1301T covers 100 kHz to 1.3 GHz ($1,500) and the PSA2701T covers 1 MHz to 2.7 GHz ($1,950). The leather case, which I recommend, runs $137. In this review, I’ll cover the PSA2701T, which I have used for a couple years now. The PSA1301T is similar in specs; mainly the frequency range is different. This is one clever little design. If examined closely, you’ll discover the entire user interface – controls and screen – is actually an embedded Palm TX PDA! By opening a couple side latches and lifting off the top cover, the PDA simply unplugs from the base unit. The PDA includes all the usual Palm applications, including Wi-Fi, so once you’re done measuring EMC, you can use the unit to check email and browse the Web! The product even comes with the original packaging and accessories for the Palm. The spectrum analyzer circuitry resides in a fully shielded base section with an SMA connector for the RF input.The Palm uses custom software to turn the unit into a fully-featured spectrum analyzer. The unit even includes AM/FM demodulator circuitry and an earphone jack at the top for evaluating potential commercial ambient signals.There are a few key hardware controls, but most are touch-sensitive soft-keys. Troubleshooting with the PSA2701T and attached probe is fast and easy. No heavy instruments to lug out to the measurement chamber or open site and no line cords to plug in. Just turn it on and go! I found I can quickly zero in on an emissions issue, even during characterization or pre-qualification testing. Emissions can be recorded via screen shots (bmp format) or tables of comma-delimited (or separated) variables (csv), which may be saved and imported into your favorite spreadsheet.What I especially like is the unlimited number of instrument setups I can save. Favorites of include 1 to 30 MHz for conducted emissions, 30 to 200 for low-frequency emissions, 100 to 500 MHz for a lot of my typical troubleshooting and 2.4 to 2.7 GHz for Wi-Fi and Bluetooth sniffing. 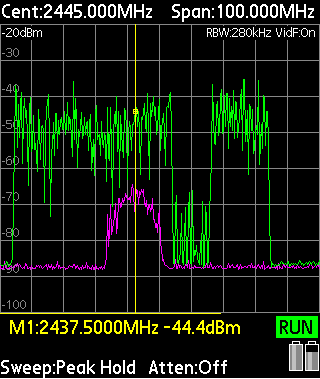 Screen capture of a Wi-Fi (violet) and Bluetooth (green) signal. Peak hold was used to allow the spread-spectrum signals to “fill in” the signal envelope. The Bluetooth signal was saved as a reference waveform. The unit is sensitive enough with the larger 2-turn Beehive loop probe I recommend, that a preamplifier is usually unnecessary. By attaching a probe directly to the analyzer, you have the perfect handheld emissions detector! However, for some signals, such as some current probes or smaller loop probes, additional amplification may be required. I use the low-noise Mini-Circuits ZX60-3018G-S+ amplifier module as reviewed in a separate document, “Low-Cost Wide-Band Preamplifier” on my Web site (under Technical Papers). This amplifier module covers 20 to 3000 MHz with a gain of 18 to 23 dB and noise figure of 2.7 dB. Beehive Electronics also has a low-cost model 150A that covers 100 kHz to 6 GHz at 30 dB gain. I’ll be posting some info on this in the near future. While the unit lacks the standard EMI bandwidths (for example, 200 Hz, 9 kHz and 120 kHz) or quasi-peak detection, I don’t find this to be a limitation during the troubleshooting process. What you’re typically looking for is “how much leakage is there now, and how much is there once I apply this fix?” Once the fixes are implemented, that’s when it’s time to measure your product in a semi-anechoic chamber with the proper measurement equipment as specified in the appropriate standards. Closeup showing the Beehive probe and analyzer showing emissions leakage from a seam. The analyzer includes a number of very handy features for general EMC troubleshooting. Features like markers, peak search, averaging, peak hold, waveform memory, amplitude scale in dBm or dBuV, screen capture and instrument setup memory – not to mention extreme portability – are found only in the higher-priced units. This is a very powerful tools for the EMC engineer. Using this low-cost instrument to perform the initial troubleshooting prior to moving the product out to a compliance test facility will save both money and time. 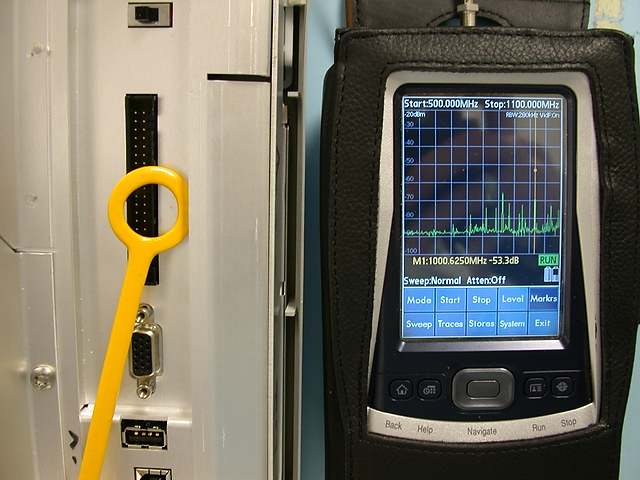 This truly handheld spectrum analyzer may be purchased for about the monthly cost of renting a bench-top analyzer. Highly recommended. This entry was posted in Reviews and tagged Review, Spectrum Analyzer. Bookmark the permalink.